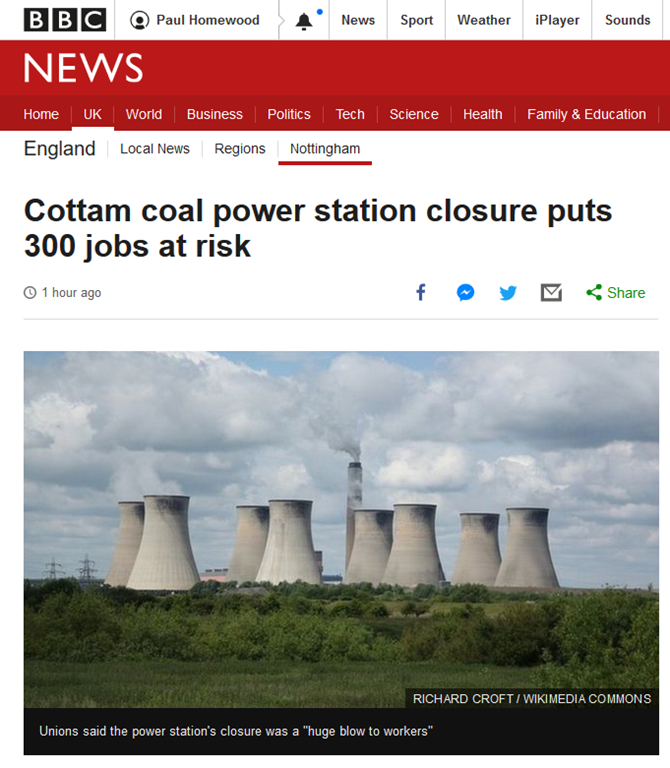 A coal-fired power station in Nottinghamshire is set to close, leaving hundreds of jobs at risk, its owners confirmed. EDF Energy said the power station in Cottam would shut on 30 September because of "challenging market conditions". Mike MacDonald, from the union Prospect, said it was a "huge blow to workers" and local people. With 300 jobs at risk, unions said the news was not a shock but "premature". Mr MacDonald said: "We had been led to believe the power station would be wound down by 2025, which would have given plenty of time to mitigate the £60m which will be lost from the local economy as a result." He added that they now need reassurances from the company and government that they will work to minimise the impact of this closure. Cottam failed to secure Capacity Market contracts for next winter or 2021/22, but may be hoping to blackmail the National Grid into awarding them a contract for SBR. Cottam is rated at 2000MW, so will take a large chunk out of the current 13000MW of coal fired capacity. Such a shame on many fronts. I worked for six months at Cottam in the early 80s when the Trent was home to proper power stations. We need more coal not less.Asia India and China are building coal power stns by the tuck lpad.They will have their industrial revolution,while May and her comrades in the climate chg committee are determined to destroy our nation,and put us back into the Middle ages,killing off the poor old and cold along the way. China laughs at us,but it is not funny,and the politicians do not care at all. Well avro I totally agree with you – I have spent some time pondering whether the vast bulk of western politicians are determined to ruin us – see UK, Dems in the USA, Australia, Canada, and Europe (perhaps excepting those in the east who have too recently observed BS at close range). I never believed much in conspiracies, but are they all just useful idiots or are they part of the plan to move to a World Government by ruining us, while they ignore the developing world (rightly) moving in the opposite direction? OR are they both! Is it part of UN Agenda 21 – Common Purpose ?? Bravo, well said. If people with similar viewpoints would only fully engage their elected representatives over the whole issue of energy supply, as it affects them, and the the way energy policy is being driven may get some serious debate in Parliament. I see this also as part of the imbalances between the rural and ever-increasing urban unrealistic. We are going to become a nation subject to blackouts and power rationing in order to satisfy the hysterical eco socialists. Only the very rich will be able to afford rationed utilities at over £3,000 to £4.000 per annum in the near future as we become the victims of renewables. When our socialist Victorian state government forced closure of the 1,600 MW Hazelwood coal fired power station in 2017 our electricity market went nuts. Victoria also suffered rolling blackouts in January as supply failed to meet demand, despite a nearly nationwide grid. Wholesale electricity prices were as high as £7,500/MWh for long periods. So the closure of Cottam could well be the instigator of similar chaos in the UK. Of course, you are right. The only reliable, 24/7, affordable energy is fossil fueled or nuclear. Those who would destroy our society as we presently know it want us back in caves. We probably won’t be hunkering over a wood fire either as the forests will be used up for heat before they can grow back! Meanwhile Sturgeon has signed another ‘climate agreement’ (whatever that is) in the USA, New Jersey this time. It’s just hard to work out how they believe what they say is remotely doable – magic windmills. Sounds like the leftie councils such as Crawley who declared themselves nuclear free zones. Missiles and fallout would just ignore the signs. Don’t worry. Claire Perry has it all sorted. After all, she has a geography degree and is a contemporay of the Moonbat. To the man at the back,Welcome. Yes,it is all about World Govt and AG21. If you have not already a good book to read is this:The Deliberate Corruption of Climate Science,by Dr Tim Ball,phd. avro607… unfortunately anyone reading this far does not need to read the book; they already understand. The problem is getting the message to those who have been conditioned not to go near a climate denier site like this. the bankster Rockefellers & their multi-billionaire cronies George Soros, Maurice Strong & Ted Warner & the faux “scientists”, John Holdren & Paul Ehrlich & many others. Click on Quotes for the 1%s motivations. Many useful graphs, charts & articles also. The most recent date for which I have data show Cottam spent much of 31st January with 3 out of 4 units fired up, producing 1.4GW. We’ve been depending on it. I do wonder if this closure is really as imminent as claimed? It was only a few months ago that the financial times and others were reporting that coal was having a resurgence in power generation because gas prices were soaring and a big chunk of our gas storage (Rough) was closed down. I’m pretty sure electricity generated from coal was cheaper than from gas in last qtr 2018 and I recently saw coal hitting 18% of total supply, admittedly on a day when the wind wasn’t blowing (a week or two ago) but it certainly seems premature to be closing it down? The strong renewables bias of the UK electricity generation market makes it increasingly tough for coal power stations to make any worthwhile profit. Hi Dave, yes all our Land Rovers have PTO mountings on the rear crossmember and the rear PTO output on the gearbox (I have some PTO parts in the workshop too). I’d just need to get the generator. However, even though they all have hand throttles fitted to allow the engine revs to be set high while running the PTO, I think I’d prefer a decent diesel generator in the back garden. Land Rover engines suffer from low oil pressure at low revs so extended use with PTO’s leads to premature wear of the bearings. A common problem when these engines were used in London Taxis. Keep Cottam open – and indeed develop new coal mines, while investing in research into clean coal energy output. UK has a fantastic resource here. No mention of the carbon taxes which provide a serious hindrance to profitability. That and favouring windmills first. The Americans have recognized the simple fact that coal is the only storable power source and are protecting their coal fired stations from early closure. Coal is still the lowest cost power (if enviro-nutters could be curtailed). Sadly, they have control of the “corridors of power”, but no understanding of power systems. That’s only 300 direct jobs. If it is the main source of employment then this is a ripple effect when it goes through all other businesses. madness but the wimin want this – and darkness stalks the nation. Can we have a definition of “challenging market conditions”, please? Am I alone in detecting a faint whiff of cattle ordure? If I were one of those threatened with job loss I would expect that my union would have a thorough explanation of what the hell is going on! Wind/solar are scared stiff of CCS ever working.